All Imnaha homes currently listed for sale in Imnaha as of 04/18/2019 are shown below. You can change the search criteria at any time by pressing the 'Change Search' button below. If you have any questions or you would like more information about any Imnaha homes for sale or other Imnaha real estate, please contact us and one of our knowledgeable Imnaha REALTORS® would be pleased to assist you. "HiLo Ranch offers premier hunting & abundant recreation! Spectacular spread in Hells Canyon Nat'l Recreational Area, miles of Wild & Scenic Imnaha River, 4 creeks, irrigation, numerous springs. Livestock scales, large feedlot, barns & silo support 800+ cows in winter. Riverfront home, bunkhouse, dividable. Trophy Elk, Mule Deer, Sheep & Goat hunting, Landowner Preference Tags. Very little snow/rain, unsurpassed beauty. Rare opportunity!" "Spectacular ranch, heart of Hells Canyon Nat'l Recreational Area. Home on the bank of the Wild & Scenic Imnaha River, fly fishing's best. Barns, livestock scale, feedlot, pastures, support large cattle operation. River, creeks, springs & irrigation. Dividable for multiple homes. Trophy big game animals, Landowner Preference Tags. Borders U.S. Forest Service - recreational opportunities abound. Rare chance to own this unique property!" "8.85ac ranch w 2,112sf home w new int paint. Scenic river fronts entire length of property. Fruit trees. Berry Vines. Farm pasture. 120+yr old historic barn + lg wood-heated shop. Lots of food storage, tools, machinery, & animal shelter areas & sheds. Inline solar & gas electric-generator, own well water & septic! Quiet helpful neighbors. No HOA! Quaint unincorp town 5mi away. not first American). $5k carpet allow, $10k off green cash." "Enjoy remote living in this stout low maintenance A-frame home. 1 bed/1 bath with new flooring and paint. Nice new decks and garden beds. Wood stove insert as well as oil monitor stove for heat. Generator included so you will not be out in the cold if there is a power outage. Enjoy close access to the Imnaha River, National forest hiking, hunting and fishing. Sale includes all major appliances and solar panels." "Beautiful setting on the Imnaha River. Deer, elk, bear & game birds. 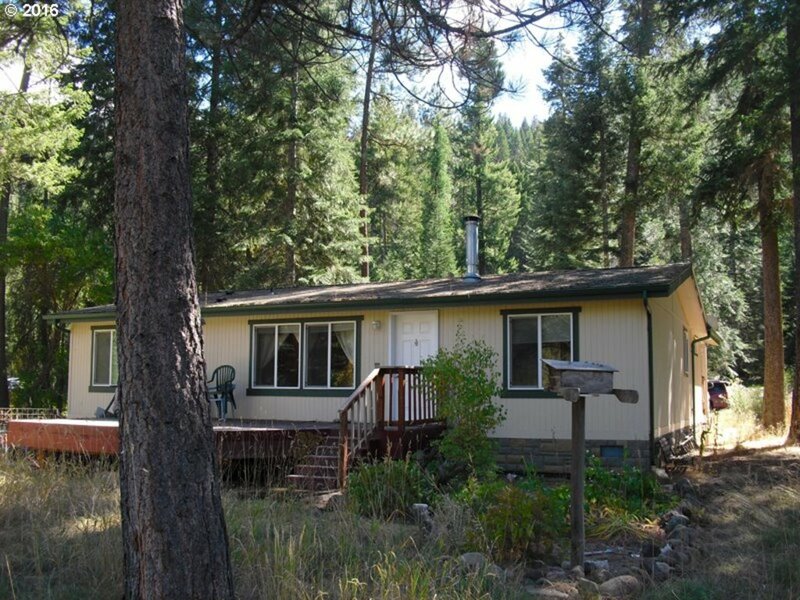 This would make an excellent year round home or hunting, fishing base camp. Rustic wood storage shed."